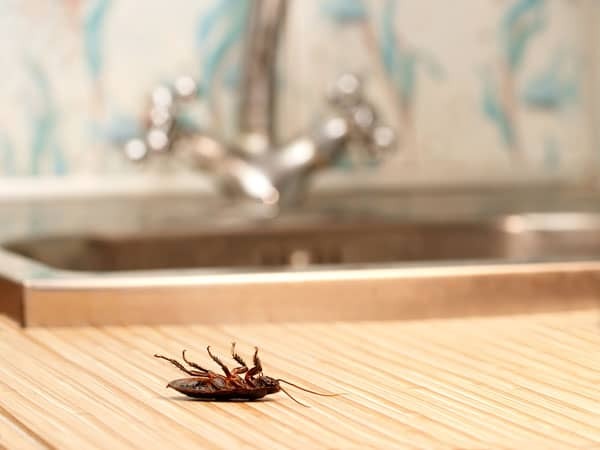 For an experienced roach exterminator in Las Vegas, contact Flatliners Pest Control. If you suspect your home has been invaded by cockroaches but are afraid of toxic chemical exposure, our pest management team uses environmentally safe products that don’t have harmful effects on your pets or children. We provide reliable roach control, removal, elimination, and prevention services with no contracts, just results. Don’t waste any more time trying to get rid of these unwanted and unhealthy pests, give us a call today. German Cockroaches are small, nocturnal, and the most difficult to deal with. Unfortunately, they are also one of the most common roaches throughout the Las Vegas Valley. They can be found near moist areas, behind baseboards, in cabinets or pantry cracks, under stoves, refrigerators, and dishwashers. As scavengers, they eat pretty much anything and are more prevalent in messy, unkempt areas. If you think you have German cockroaches at your home or business, it’s critical to call in the professionals at Flatliners Pest Control. Infestations can spread extremely quick, and the longer you wait, the harder they are to get rid of. Another fairly common variety in Las Vegas, American Cockroaches are about one and one-half inches long and can fit into small cracks and under doors. They eat most foods but are more attracted to things like cheese, beer, tea, bakery products, starch, and even human or animal bi-products such as hair and skin flakes. The American variety is less likely to cause an infestation, and can usually be eliminated quicker when compared to German roaches. These nasty insects can be extremely difficult to get rid of regardless of the species since they can adapt to almost any environment. They live by night and are adept at quickly disappearing into multiple hiding places. You can help by keeping any dark or out of sight areas clean, and sources of food contained, but if you already see roaches in your household, it’s usually too late for over-the-counter pesticides or other at home treatments. A quality cockroach exterminator can be hard to find in Las Vegas. At Flatliners Pest Control, our experienced and highly trained professionals are skilled at identifying the cockroach infestation and will go above and beyond to eliminate your roach problem. We pride ourselves on providing you with an unmatched level of roach control in Las Vegas. Unlike other pest control companies, we show up on time, our products are safe, and we don’t lock you into a long-term agreement. No contracts, just results. Ready to say goodbye to these unwelcome pests? Contact us today.